I've talked about how libraries and librarianship is a service oriented/people profession in the past. 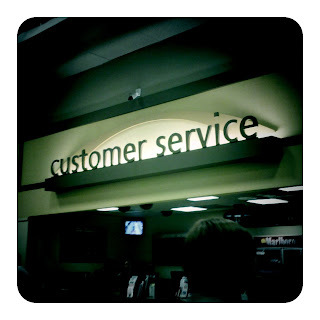 I've written about handling difficult patrons, pondered where the customer service/pedagogy line should be at the reference desk, why I know my customer service skills from waitressing have made me a better librarian, and about the need to keep gossiping down to a minimum while in the public eye. Some might say that I've talked about it enough already, ad nauseum really, but there's something I've been considering lately that I think needs to be discussed. The thing is, staffing the desk is not about you (or another member of the library staff) seeing the customer/patron/community member. Well... it's not JUST about that. It's also about you being seen by the customer. Think about it this way: if you don't have an urgent question, are you really going to go hunt someone down? Or are you just going to assume that nobody is available and skip asking all together and not even approach the desk? Would you expect more from someone in your community? We need to do more than *be* available. We also need to appear available. To my way of thinking, appearances count, hugely. Perception *is* reality for our customer base/community. Or am I completely off the mark? My dad was a librarian. He pretty much rates libraries on whether you can see a person to help you as soon as you enter. If you can't, he just assumes incompetence. The attitude kind of rubbed off on me, but seems legit based on about 6 years of retail sales work. Most of your patrons know the ropes, but you should prepare for people walking in with absolutely no knowledge about how things work. One of my gripes and in direct conflict with the "get out in the stacks" movement in library service. Patrons want human contact and are used to looking to a central point (read desk or counter) to get it. I'd much rather my staff be clearly available at a well marked and easy to get to circ or reference desk than have patrons wandering around wondering who was around. And let's not even get into what the ramifications could be if a funder walked in and saw no one around to help! I hadn't even thought of the funder angle. Good point. At our library, we're running into the "unified service", which, in theory, means that everyone should be able to do basic circ and reference tasks, and everyone is at one desk. The problem with this idea is that we've gone from 4 points of contact to 2 or even 1. Need to do an indepth reference help? Better get back to that line. Have a quick question? Wait in line behind the people with 50 books and a need for five new library cards. And this says nothing of the fact that some circ staff simply aren't qualified for reference. I agree, but I believe that it goes beyond just being seen. The person behind the desk needs to convey a sense of openness and approach-ability. There needs to be warmth there. A person with their head down and a frown on their face is just as bad as no person at all. Absolutely! The thing that bothers me most about the set up of our entry way is that there's a load bearing column between the circulation desk and the front door. Makes it awkward to smile at people as they walk in. I so agree with you! I also agree that many librarians/library administrators are sending mixed messages with the multi-task/be out in the stacks/etc. movement these days. On one hand, down time at a public desk is a good chance to get some work done. On the other hand, does that present an inadvertent "don't bother me I"m working" message to patrons? On one hand, yes, get out from behind the desk -- be approachable! On the other hand, do patrons see someone who can help them? I think it's important to know your patrons and what they want, to have more than one person trying to do it all (when possible), and to make sure that staff understand what the priorties are. For a lot of my community, seeing somebody there the moment they enter the building is a HUGE thing.